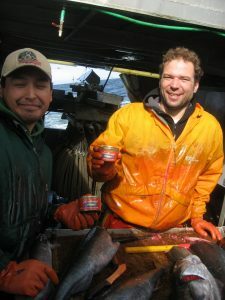 Even in a literal sea of the world’s finest and freshest seafood, Alaska fishermen eat canned Alaska salmon. Remo Lotscher and Andy Zuanich of the M/V Primus take plenty of canned Alaska salmon on their longline trips in the Bering Sea. 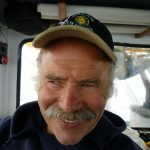 Canned Alaska salmon, both Thinkpink pink salmon and Redhead red salmon, are easy to eat and deliver the highest quality protein for optimal energy when working the long hours on a fishing boat. They eat canned Alaska straight out the can when there isn’t time for food preparation. Those are black cod that they are processing fresh on the boat.